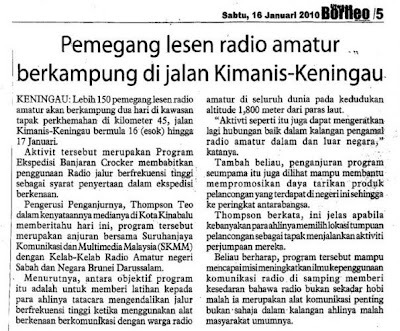 Dixing Summit On The Air (SOTA) was held on the 16th & 17th January 2010 at the KM45, Crocker Range, Kimanis / Keningau, Kota Kinabalu Sabah, Malaysia. 10 members from GARS (Gemilang Amateur Radio) has attended the two days dixing. There were v8nfa,v88ave,v8arg,v8ahg,v88drs,v8aqm,v89akj,v89has,v8mut and v89mix.